What if traditional rural settlements were historic urban nuclei? 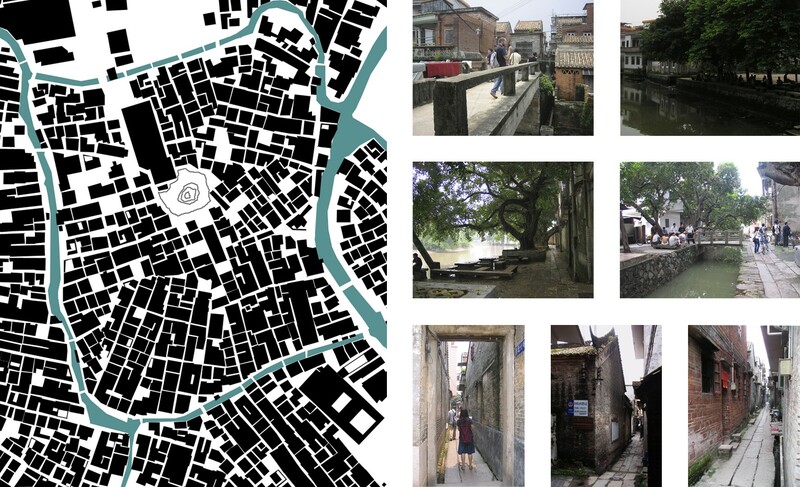 Layout and features of Xiaozhou Cun (International Urban Planning and Design Workshop organized in 2006 by: South China University of Technology, Università di Ferrara, Guangzhou Academy of Fine Arts). Diagram of buildings transformation in Pantang Cun; students’ work at the South China University of Technology (2013; in cooperation with Bergen School of Architecture). Consulting local people, the student Yi Ding depicted the evolution of three houses. The transformation of traditional villages in coastal China is a remarkable counterpart of city growth since the late 1980s. Villages maintain an aura of ancestral kinship, but also accommodate newcomers and incorporate small business entrepreneurship in the vicinity of expanding city areas. The advantages of locating in villages mostly concern settlement cost, which is generally cheaper. Indeed, in terms of regulations and decision-making, villages also offer loose regulations as bureaucratic procedures are frequently substituted by personal trust and individual contracts. The current model of mega-urbanization and global modernization emphasizes, in China as in many other contexts, the high adaptability and resourcefulness of traditional settlements. In 2000, the municipal “Research on the countermeasure for the planning, construction and management of the ‘urban villages’ in Guangzhou” surveyed 139 villages amidst the urbanized area. Guangzhou – the capital of Guangdong Province and the largest city of the Pearl River Delta – is an urban agglomeration whose population has doubled from about 6 million to 12 million people between the late 1980s and 2010. It is estimated that nearly 80% of the built stock is less than 30 years old and, by and large, it results from farmland conversion to urban area. Contrary to other cities in China, villages in former rural areas were not totally removed during the urban expansion of Guangzhou, to reduce contested dispossession, people’s relocation and expensive compensation procedures. Yet, villages surrounded by the new city were named “villages in the city” or “urban villages”. Local inhabitants incrementally modernized their buildings to match with the surrounding urban context, but for the most part the layout of narrow alleys and dwellings allotment beside ancestral family halls were respected. This regular fabric dates back to hundreds of years and characterises for historic continuity and quasi-urban contextualization that new city development cannot accomplish. Villages adapt to opportunities and new needs. Villages retain a distinct way to deal with the inhabited space, in which village’s inhabitants are relatively free to pursue immediate convenience and individual choices are made coherent by the respect of communitarian rules settled by the native family clans. In fact, contrary to the city, villages do not obey urban planning regulations and standards as far as land use is regulated directly by the village collective and not by state administration. Yet, only a minority of built structures outlive their builder. The respect of codified household allotment in case of building reconstruction guarantees a certain layout regularity even in absence of formal building codes. Villages remain different even while becoming more urban, as their transformations rejuvenate a multifaceted tradition. 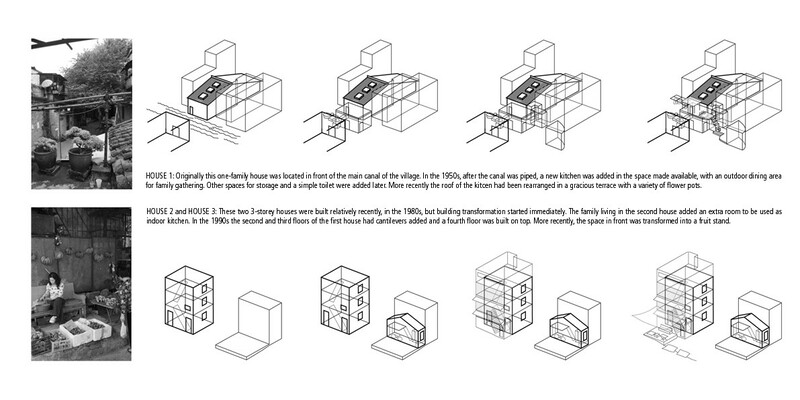 The range of home-grown transformations is better understood while observing a single house. The traditional single-story buildings with curvy roofing and grey brick walls are still visible in some cases. More frequently, households have written a history of social and economic upgrade in house transformation: elevating storeys, installing AC engines and iron fences, introducing coloured tiles, toilets and kitchens, etc. In doing so, families respect the law of the village that assigned allotments to each household according to a precise order along main and secondary streets. Native people practice a pragmatic coexistence with migrants, who rent extra floors and live in the most undesirable places, but thus far have in villages the sole chance to approach urban life. Villages without farmland have demonstrated capacity to self-adapt and reinvent their role in the urbanizing society. Needs evolve, spaces transform, new functions overlay, newcomers substitute the former inhabitants. There are social processes of inclusiveness in villages that are not shared by most monofunctional residential compounds (housing, basic schooling and security are granted to native villagers, who contribute directly to their management via local committee, but can be accessible to migrants upon payment; this is not the case in the city). The informality of villages is far from being without rules. Space and building morphology of villages reflect the traditional social organization of family networks. The spatial layout, in other words, materializes a collective appropriation of space, something that Chinese modern urban planning refused in principle in cities. Contradictorily, urban villages display lively pedestrian open spaces, heterogeneous street life and pocket landscapes that were common experiences for most people until very recently. Villages are not remote, they are part of the city and can be easily reached by bus and subway; villages and the formal city share the same context of urban life, as most of the inhabitants engage in urban works and have daily contacts with citizens. Notwithstanding spatial and substantial economic proximity, the specific diversity of villages is based on conflicting concepts of ownership and territoriality. Villages and cities are cross-border urban landscapes in which same practical issues act against two different set of institutions. On the other hand, village mechanisms and individual fantasy have generated the so called “handshake building” picturesque typology, which is rather unhealthy. Challenging cantilevers promise extra-room to each house, but in fact reduce natural light and air circulation to all. This private appropriation of collective areas generate semi-dark alleys that certainly are inconvenient in case of emergency or fire accident, and in which the urban folklore multiplies the sense of oppressing control or the opposite fear of unruled activities. Generally citizens wisdom and technical interventions by the urban planning bureau stigmatize villages as “wrong” illegal and uncontrolled places. The effort is to normalize the existing niches of multifunctionality within the city, aligning them as much as possible to urban characteristic and encircling “memory” into sanitized heritage boundaries. Too frequently, the repetition of this pattern of intervening on spaces to get control of management issue has weakened resources for our cities. Francesca Frassoldati has been working on the “urban village” concept since 2006 at the South China University of Technology. Urban Villages, which were not long ago an “exotic” theme for international scholars, are now increasingly recognized by Chinese scholars and students as structural parts of present-day city and not only grey areas in urban plans. The future of such settlements is uncertain, as a reflection of the troublesome relationship with traditions, collective memory and social divide in Chinese society. 3-day workshop in Geneva on October 13, 14, 15 to produce a participatory neighbourhood plan. Planning the planned city of Navi Mumbai.